Leoyla Cowboy was among the many indigenous people from around the world who came to North Dakota to participate in the Dakota Access Pipeline protests. 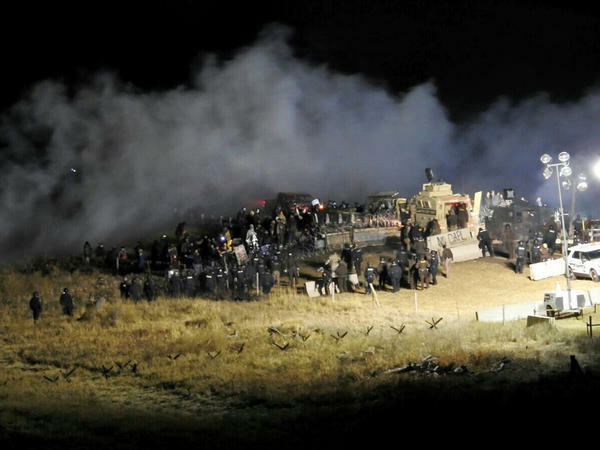 Law enforcement and protesters clash near the site of the Dakota Access pipeline in Cannon Ball, N.D., in November 2016. Morton County Commissioner Cody Schulz says the Dakota Access Pipeline protests cost his county nearly $40 million. The state paid much of that cost. Two years ago in North Dakota, after months of protest by thousands of indigenous and environmental activists, pipeline opponents celebrated when the Obama administration denied a key permit for the Dakota Access Pipeline (DAPL). A few months later, the Trump administration reversed that decision and approved construction. Pipeline opponents worried that a spill from the Dakota Access Pipeline would pollute drinking water for the nearby Standing Rock Sioux reservation. "It turned out to be a massive gathering — a world-wide gathering," recalls current Standing Rock Sioux Tribal Council Chairman Mike Faith. Faith says the protests sent a message to the world that Native Americans were standing up for themselves, encouraging indigenous people from around the world to join the demonstrations. Among them was Leoyla Cowboy who left her job and home in New Mexico. "I'm still here. I haven't really left," laughs Cowboy. The demonstrations changed the course of her life. At the protest camp she met and married her partner. Michael "Little Feather" Giron is among the hundreds of protesters arrested during the anti-DAPL movement. He pleaded guilty to civil disorder charges. Prosecutors say he was seen pouring fuel on a barricade that was set on fire. Cowboy says Giron is scheduled for release from federal prison next October. Meanwhile she has landed a job in North Dakota as an organizer with the Water Protector Legal Collective. "What's been really great and blessing is, being an indigenous woman, learning how to maneuver through the legal system," Cowboy says. Two years later, the legal system in North Dakota is still busy processing the people arrested during the anti-DAPL protests. Many have had their charges reduced or dismissed. There is also a string of active civil suits that have yet to be resolved. One was filed by protesters who police sprayed with water in freezing temperatures. Another, filed by the company that built the pipeline, Energy Transfer, is a lawsuit filed against Greenpeace and other environmental groups for inspiring the protests. And in yet another case, tribal members and others filed suit over the shutdown of a local highway near the protests for five months. That shutdown hurt business at the Standing Rock Sioux's Prairie Knights Casino. The tribe won't say how much. But The Bismarck Tribune reported the tribe suffered a $6 million budget shortfall, largely because less money was coming in from the casino. "I feel the economy is coming back slow but it is coming back. I think we're trying to mend fences now," Chairman Faith says. Divisions between the tribe and local residents, who are mostly white, intensified because of the protests. Most people an hour's drive north in Bismarck don't want to talk about that, but Mandan resident Craig Keller is an exception. "People weren't happy about what was going on and the way protesters were treating other people," Keller says. When demonstrators clashed with police at the state capitol and a local shopping center, and many North Dakotans viewed their actions as rude. But fewer than 6 percent of those arrested were from North Dakota, according to Morton County Commissioner Cody Schulz. "A lot of the troubles and problems that happened were created by people that are no longer here, so there is no reason for anger at our neighbors and friends," Schulz says. Schulz says the protests cost his county nearly $40 million for police, fire, including repairing damaged infrastructure, cleaning-up protest camps and prosecutions. The county's emergency fund is only $500,000, so the state legislature picked up most of the tab. North Dakota can afford to do that because the state's oil business is booming. The Dakota Access Pipeline is moving more than 500,000 barrels of oil a day and, despite the protests two years ago, the oil industry is expanding. "We are building pipelines here every day," says Ron Ness, president of the North Dakota Petroleum Council. North Dakota's oil production is growing so fast the state likely will run out of pipeline capacity next year, which is one reason Energy Transfer recently announced it plans to expand its Dakota Access Pipeline so that it can transport even more oil. One of the first things President Trump did when he took office was reverse President Obama's decision on the Dakota Access Pipeline. President Obama had effectively blocked it. President Trump effectively allowed it to move forward. That was an early win for the fossil fuel industry and a blow to protesters against the pipeline. So what's happened since that moment? NPR's Jeff Brady reports. JEFF BRADY, BYLINE: This was the chant heard often as demonstrations began to attract attention in August of 2016. UNIDENTIFIED PROTESTERS: (Chanting) Mni wiconi. Water is life. Mni wiconi. Water is life. BRADY: Protesters borrowed from the Lakota language to express their concern that a spill from the Dakota Access Pipeline would pollute drinking water for the nearby Standing Rock Sioux reservation. MIKE FAITH: It turned out to be a massive gathering - a world-wide gathering. BRADY: Mike Faith is the current chairman of the Standing Rock Sioux Tribe and says the protests sent a message to the world that Native Americans were standing up for themselves. Many Indigenous people from around the world joined the demonstrations. Among them, Leoyla Cowboy, who left her job and home in New Mexico. LEOYLA COWBOY: I'm still here (laughter). I haven't really left. BRADY: At the protest camp, she met and married her partner. 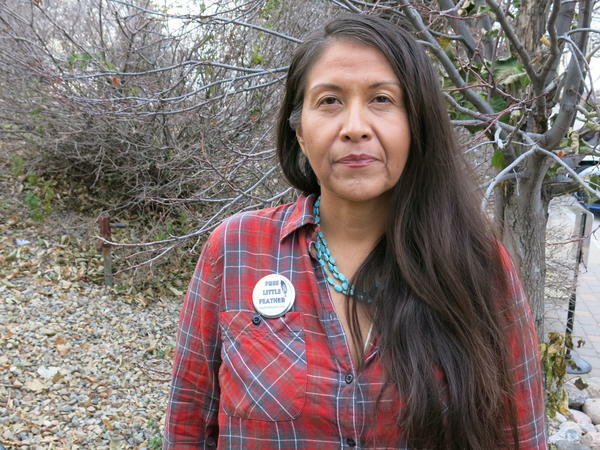 Michael Giron, also known as Little Feather, is among the hundreds of protesters arrested. He pled guilty to civil disorder charges. Prosecutors say he was seen pouring fuel on a barricade that was set on fire. Giron is scheduled for release from federal prison next October. Meanwhile, Cowboy landed a job in North Dakota as an organizer with the Water Protector Legal Collective. COWBOY: What's been really great and a blessing is being an Indigenous woman learning how to maneuver through the legal system. I didn't know anything before I got here. BRADY: The legal system in North Dakota is still busy processing the protesters who were arrested. Many have had their charges reduced or dismissed. There is also a string of active civil suits, one filed by protesters who police sprayed with water in freezing temperatures. In another case, the company that built the pipeline, Energy Transfer, is suing Greenpeace and other environmental groups for inspiring the protest. And yet another case - tribal members and others seek damages over the shutdown of a local highway near the protest for five months. That shutdown hurt business on the Standing Rock Sioux reservation. BRADY: At the tribe's casino, business was down. The tribe won't say how much, but the Bismarck Tribune reported the tribe suffered a $6 million budget shortfall largely because less money was coming in from the casino. Tribal Chairman Mike Faith says business has improved since then. FAITH: I feel the economy is coming back slow, but it is coming back. I think we're trying to mend fences now. We - some of them may never get repaired. BRADY: Divisions between the tribe and local residents, who are mostly white, intensified because of the protests. Most people on the street an hour away in Bismarck don't want to talk about that. Craig Keller (ph) is an exception. CRAIG KELLER: People weren't happy about what was going on and the way the protesters were treating other people. BRADY: Demonstrators even clashed with police at the state capitol and a local shopping center, and many here saw that as rude. 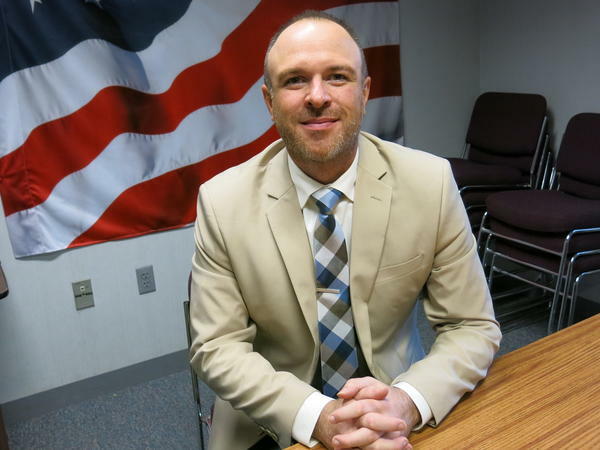 But fewer than 6 percent of those arrested were from North Dakota, says Morton County Commissioner Cody Schulz. CODY SCHULZ: A lot of the troublesome problems that happened were created by people that are no longer here, so there is no reason for anger, you know, at our neighbors and friends. And I think that's part of the healing process as well. BRADY: Schulz says the protests cost his county nearly $40 million for police, fire, repairing damaged infrastructure, cleaning up protest camps and prosecutions. That dwarfed the county's half-million-dollar emergency fund, so the state legislature picked up most of the tab. It can afford to do that because North Dakota's oil business is booming. The Dakota Access Pipeline is moving more than a half million barrels of oil a day. And Ron Ness with the North Dakota Petroleum Council says despite the protests two years ago, the oil industry is expanding. RON NESS: We're building pipelines here every day. And they may not all be the size and magnitude of the Dakota Access Pipeline, but there are various construction projects, pipeline projects happening in North Dakota on a daily basis. BRADY: North Dakota's oil production is growing so fast the state likely will run out of pipeline capacity next year, which is one reason Energy Transfer recently announced it plans to expand its Dakota Access Pipeline so that it can transport even more oil. Jeff Brady, NPR News, Bismarck, N.D. Transcript provided by NPR, Copyright NPR. Officials in Oklahoma are now using advanced technology in an attempt to get ahead of the spate of earthquakes caused by fracking and wastewater disposal by oil and gas companies. The technology is much needed, as the third largest earthquake in state history was recorded last month. New seismic sensors have now been put in place to locate and determine the size of the nearest fault line to the big quake’s location in Fairview, reports KFOR. The Oklahoma Geological Survey has also installed a broadband seismometer, an instrument that locates earthquake sources.